It also spreads water evenly over it's surface so that it dries off faster leaving the glass clean and with reduced streaks. This specialist glass only costs marginally more than normal toughened glass. The Pilkingtons Activ™ Self Cleaning glass are the Activ™ Clear, Activ™ Neutral tinted glass and Activ™ Blue tinted glass. Available colours are Clear slight tint, Neutral tint or a blue tint. 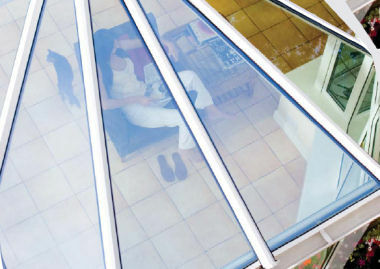 Pilkington's Activ™ World’s first true self-cleaning glass - Latest technology. Water spreads evenly over the glass surface to form a thin film, helping to wash dirt away, and drying off quickly, therefore benefiting from reduced streaks. Pilkingtons Activ Self Cleaning Glass is not like Easy clean glass that just makes it easier to clean your glass, it actually uses the forces of nature to maintain a cleaner and clearer appearance. Since no-one enjoys cleaning windows, the coating on the glass actually helps to dramatically reduce the dirt build up and cleaning required. As the sun heats up the coating on the glass it lifts off the dirt, which is then washed away when it rains, or with a quick spray of water. Water spreads evenly on the glass when it rains, resulting in the water drying quickly and leaving no streaks.